WHISKEY FOR MY MEN, BEER FOR MY MINISThe miniatures for the OwlCon adventure (see story below) paused for a photo op in front of our stunning "Cold Death" Beer stein, which is just one of the many great prizes available in our Online Contest. The names are piling up in the hat for the Spring drawing in the Gutshot Online Contest. "It's that time again," said Gutshot co-creator Mike Mitchell. "The rodeo is in Houston, so I can't think of a better time to be thinking about getting some great Gutshot gear, especially for free!" The Houston Livestock Show and Rodeo runs every day from March 2 - March 21. Averaging well over 1 million spectators each year, RODEOHOUSTON™ is ranked as the largest rodeo in the world. The event recently moved from the historic Astro Dome to Reliant Stadium, which is the only stadium of its kind built specifically for rodeo and football. "I was there the other night enjoying the sights, sounds, and smells and couldn't help but appreciate the sense of tradition behind the skills that are displayed in a rodeo," Mitchell said. "Even though my favorite events are the bull riding and the steer wrestling, I don't think I'm going to work up any tables and rules to include those in Gutshot," he said with a grin. 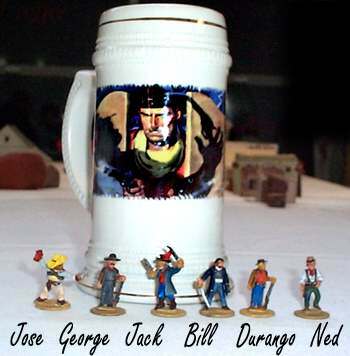 Although Mitchell didn't wear any Gutshot gear to the rodeo, he admits that the "Cold Death" beer stein would have come in handy while drinking some of that ice cold Shiner Bock beer during the show. "You could win your own stein, or anything else from our General Store, just by sending us your e-mail address," Mitchell said. "If you haven't done so already, mosey over to our Contest Registration Page and sign up for the next drawing, which will be March 15, 2004." As with previous contests, the winner will get to pick one item of Gutshot Merchandise from the General Store. The store currently carries T-shirts, baseball caps, mousepads, a barbeque apron, a new wall clock, and lots of other items that'll make you happier than a riverboat gambler with three aces up his sleeve! And remember, if you've registered in the past, you don't need to do so again. Your name stays in the hat until you win!